The Loo has a small overall footprint, allowing it to be located right on the street on sidewalks or other tight spots. It also can be solar powered which allows it to be put almost anywhere, as long as there’s water sanitation hookup. This isn’t feasible for most traditional restrooms, or even most smaller public toilets. Made with heavy-gauge stainless steel wall panels that have a graffiti-proof coating, they are tag-proof, fireproof, sledgehammer-proof, bleach-proof and predicted to last up to 100 years. If for some crazy reason it does get damaged, the panels are easy to replace. Unlike other restrooms, there’s no basin or running water inside. The hand-washing feature is on the exterior, which allows more people to use it in a quicker time period – up to 300 flushes per day, comparable to an airport restroom! This also deters any clothing or body cleansing, which can easily be done in other public restrooms with a sink inside. The open grating at the bottom and top allows law enforcement and security personnel to observe how many people are inside, and yet the occupant still has complete privacy. This also allows for conversations or other sounds to be heard easily right outside. There are also purple lights, sometimes mistaken for a fancy feature but actually deter intravenous drug use, as the hue makes it difficult to find your veins. There’s also an exterior light that shines until someone enters. That’s when the outside light goes off and the inside light comes on, so everyone knows it’s occupied. There have been several prototypes of the Portland Loo to test design issues, resulting in a toilet that has addressed many potential problems – and now comes with a warranty. The first Portland Loo was installed over 10 years ago, and it still looks almost brand new today! There’s a cabinet of cleaning supplies inside, which makes maintenance self-contained and easy. The restroom dimensions and parts are interchangeable if damaged or needing update. Plus the plumbing and building components are commonly used by cities so they’re easy to find or upgrade. The Portland Loo’s design has also earned the city’s first patent! Thus, Portland gets a percent of the profit. 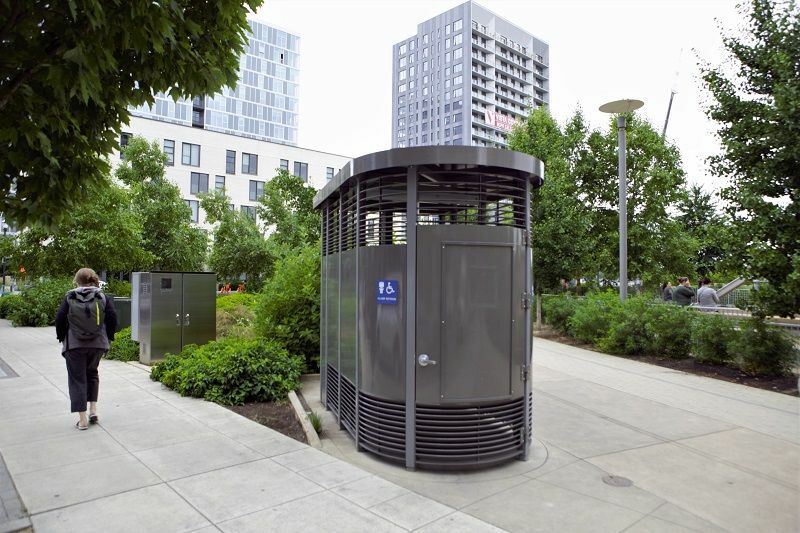 With it’s high durability and low maintenance at a fraction of the cost of most current stand-alone city restroom models, it’s a great solution for any city or organization. If you’re looking for a restroom solution, contact us for more details and pricing.